Take a shortcut to increased productivity with the ALBA Keyboard for Steinberg Cubase 10 & Nuendo 8 form LogicKeyboard. 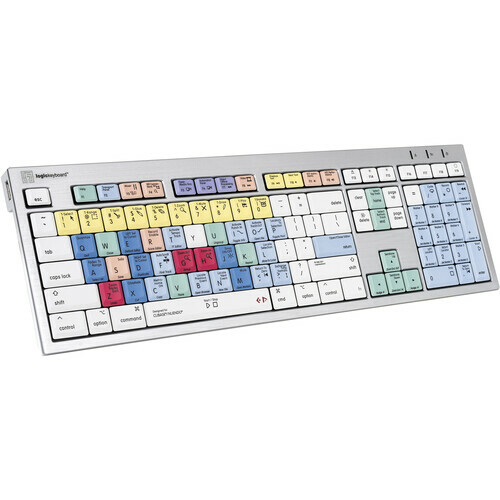 Most programs have an assortment of keyboard shortcuts that can make it faster and easier to get work done, especially professional applications such as Steinberg Cubase 10 & Nuendo 8. This keyboard has been designed to take advantage of those shortcuts. Many of the keys are color-coded and printed with shortcut icons and information that's specific for Steinberg Cubase 10 & Nuendo 8, so you can get your work done more quickly without having to memorize a library of commands. This macOS-compatible USB keyboard is still fully functional as a regular keyboard, with all of the normal letters, numbers, and names printed onto the keys alongside the shortcut information. Whether you're typing an email, composing music, or recording, it helps to have a keyboard that is designed for comfort. LogicKeyboard partnered with an ergonomic therapist to help determine the optimum ergonomics of the ALBA. This resulted in a typing angle of 8.5° with leg lifts in place, 4.5° without leg lifts, and an optimized key travel of 4mm. The ALBA keyboard features a USB 2.0 Type-A port on either side for the attachment of additional peripherals. You can use it for almost anything, including a Bluetooth adapter, mouse, or flash drive (all available separately). Each USB port provides up to 100mA of power to help operate some optional peripherals, as well as providing a small amount of charging power to mobile devices. Box Dimensions (LxWxH) 18.8 x 7.7 x 1.5"